GLUTEN-FREE, GRAIN-FREE, REFINED SUGAR-FREE & SPECIFIC CARBOHYDRATE DIET (SCD). 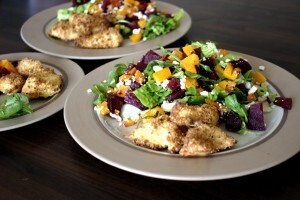 Not only does this Butternut Squash, Beetroot & Walnut Salad taste amazing, it looks great too. It’s a great recipe to use up some leftover roaster butternut squash as well. Since starting SCD I absolutely love leftovers. Preparing food from scratch 24/7 can get tiresome so making good use of leftovers can be a lifesaver. We eat salads a lot in our house and this is one of our favourites. I’ll make a big bowl of it for Saturday lunch and we’ll pair it with some leftover meat or fish from the night before. It’s also super delicious on its own. The combination of dry curd cottage cheese and the sweetness of roasted butternut squash makes this a hit with all the family. You can find more information about dry curd cottage cheese by clicking here. Don’t be afraid to add different colours and textures to your salads. That is what makes them sing! 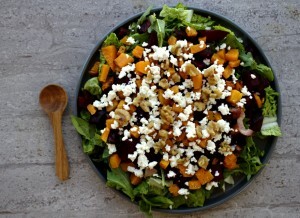 In this salad I have layered greens with roasted butternut squash with steamed beetroot, dry curd cottage cheese and topped it off with some delicious walnuts. If you want to learn how to prepare five days worth of salads all at once, check out my Mason Jar Salads post. Just one hour’s work on a Sunday evening will set you up with lunches for the whole working week. This Butternut Squash, Beetroot & Walnut Salad can be kept in Mason Jar Salads too. 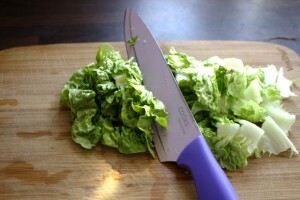 Just make sure to follow the basic salad jar rules I have set out in my above post. A delicious colourful salad with layers and textures to delight your palate. Gluten-free, grain-free and suitable for the Specific Carbohydrate Diet (SCD). 1 cup (225g) Dry curd cottage cheese/Polish cheese "twarog"
Preheat the oven to 180°C Fan, 200°C electric, 390°F or gas mark 6. Toss the butternut squash with olive oil. Season with salt and pepper and roast for 30 minutes. 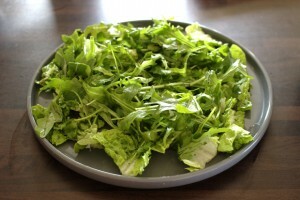 While the butternut squash is roasting, start preparing the salad. First layer the greens, followed by the butternut squash, beetroot and dry curd cottage cheese. Top with the chopped walnuts. Finish by mixing together all the salad dressing ingredients and mixing well. Toss over the salad and serve immediately.